The art in my dining room is actually the back covers from Cooks Illustrated magazine! I had received a few issues in the mail for free and saved them because they were so neat. Then I found out that my mom is subscribed to the magazine, and she generously allowed me to steal the back cover off of her issues! So, I had the artwork, but now how to frame them affordably? 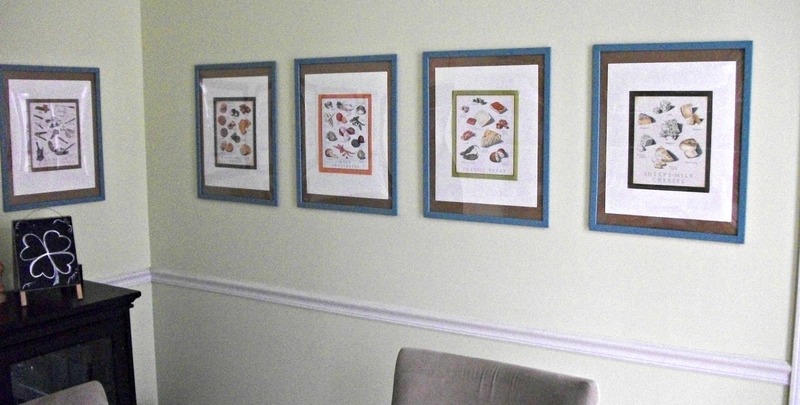 I wanted a continuous look around my dining room, which meant a lot of frames. As is the theme with this dining room, IKEA delivers again! They had these large (16×20) frames for only $4.99! My original intention was to paint the frames turquoise, but it turns out they had this style in a turquoise color – win! However, because these frames are so inexpensive, they do not come with a mat. Here is my trick: I used a sheet of art paper as a “mat” and used the cardboard backing as the additional “mat.” The art paper is great because it has a nice weight and texture to it, so it looks more like mat paper than standard printer paper. The kraft-colored cardboard backing was the perfect neutral and goes great with most decors. Framing costs can really kill a budget, so being able to put up ten framed art prints for $50 is a great deal! I had that same idea for the covers a couple of weeks ago! Looking on eBay for back issues that I can swap out seasonally and that don’t have mailing stickers on them. I don’t have as much wall space in my kitchen so will probably need to use smaller frames but the mat cheat is pretty good! Thanks, Liz! The artwork on those covers is such a great find! You’ll have to let me know how it turns out in your kitchen.